We are recruiting two Member vacancies on our Committee for Scotland and three Member vacancies on our Committee for Wales. Committees take decisions on all requests between £50,000 and £1million and provide a crucial country perspective to the HLF Board on larger grants, targeted initiatives and on regional priorities. These posts present an exciting and challenging opportunity for individuals with a strong commitment to, and enthusiasm for the UK's diverse heritage. Eleven town centres across the UK are to receive a much-needed boost of £14m, the Heritage Lottery Fund (HLF) announced today. The earmarked¹ money will help fund vital community regeneration schemes in these currently neglected areas. This investment is part of the HLF’s Townscape Heritage Initiative (THI) which has invested nearly £200m since 1998 into regenerating towns that have suffered serious social and economic decline. The Trustees of the British Museum are delighted that Camden Council has given planning permission for the World Conservation and Exhibitions Centre. The building will ensure the British Museum can meet its fundamental obligations of preserving, researching, displaying and lending this unparalleled collection for future generations. The building will ensure the British Museum remains one of the world’s leading museums, a civic space serving a local, national and international audience. Real properties owned by people who take pride in their homes and gardens are captured in the handcrafted and unique ceramic models made by Nottinghamshire based artist Richard Rogers of RAR Ceramics. With over 30 years experience in art and ceramics, his business now takes him all over the UK from Scotland to Sussex, South Wales to Norfolk, making models of a rich variety of homes. These have included converted stable blocks, rectories and other listed buildings, some dating back to the 1400’s, and also a number of modern properties. PPS5 replaces Planning Policy Guidance Note 15 and will apply to all planning decisions affecting “Heritage Assets” taken after 23 March 2010. 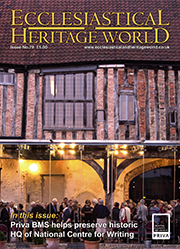 English Heritage have published simultaneously their “Historic Environment Planning Practice Guide”. Urgent appeal – The Brooking Collection is at risk! Your interest in Britain’s heritage has inspired us to write and ask for your help in our quest to preserve this vital heritage for the future. The very nature of Charles Brooking’s unique Collection has relied on his dedication in rescuing, for the nation’s future generations, important items of architectural detail before they are consigned to the skip, sold to the highest bidder or, worse still, destroyed. IAN HARVEY, the new chairman of the Federation of Traditional Metal Roofing Contractors, reflects on the first two years of the federation and its efforts to introduce and police quality standards in traditional metal roofing. In stepping into David White’s shoes as chairman of the FTMRC, I can’t help but reflect on his parting statement: “So far, so good; but we have a long way to go.” That is certainly very true, but at least under David’s leadership we have laid firm foundations and I look upon it as now being my job to build upon those foundations as we continue to progress within the roofing sector of UK construction. Finding a reliable and honest tradesman these days can be a minefield. It’s difficult enough just avoiding the cowboys for jobs around the house let alone for specialist jobs for heritage and ecclesiastical work where high levels of skill and competence are needed. The Guild of Master Craftsmen only accepts members who can prove their skill and integrity which is why they are always in demand. Historic Scotland is delighted to announce the award of a series of specialist contracts for its ongoing Stirling Castle Palace Project. The contracts are part of a £12 million scheme, which will see the royal palace of James V returned to how it may have looked in its mid-16th century heyday. Among the successful bidders is Chris Topp & Co, of North Yorkshire, which will create metalwork for the palace, including fire irons of the type that would have been essential in helping keep the palace warm for the royal family and courtiers. Ladycross Quarry, situated in the middle of Slaley Forest, is one of the few remaining quarries in England where the stone is won by hand. The layers are separated by very level bedding planes. This means that the stone can be worked by hammer and wedge as it is used throughout the ages, and no explosives are used. Bob Dunbar of Random Sounds has a history of over twenty- four years of developing specialist installations in places of religious worship embracing a wide range of amplification techniques. The varied styles of worship in the modern world demand a wide range of systems. In August 2008, Ellis & Co. of Shepton Mallet, Somerset commenced masonry & roofing works to Bramshill Mansion, a Grade I listed building and Grade II* listed landscape, which is currently The National College of Police Leadership. Works continue with Ellis supplying a team of Masons/Conservators working both on site and in their banker shop to conserve and where necessary replace masonry and brickwork and Carpenters, Tilers and Leadworkers working on the building’s roofs. One of the most important historical buildings in South East England, Grade I listed Lewes Priory, is to be transformed into a top visitor attraction thanks to a confirmed* Heritage Lottery Fund (HLF) grant of £545,500.